Fine variable-mu RF or IF pentode amplifier tubes manufactured for the Armed Forces in the United States by Tung-Sol. 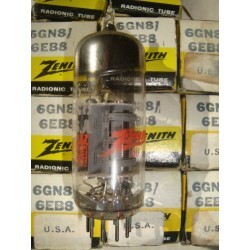 These tubes, electrical equivalent to VT-69, 6U7 and 58, come with 6 pin bases, top cap and bottom getters. They are glass etched 6D6 and printed on base JAN-CTL-6D6 VT-69 TUNG-SOL MADE IN U.S.A. Boxes are standard military beige under contract NXSR-92645P dated 1945. Some tubes are also marked NATIONAL UNION made by SUBMARINE SIGNAL CO. Photo is typical of available stock.